Howard & Sons, the leading pyrotechnics company in Australia, has representatives all over the country ready to help and advice with the design and creation of your event fireworks or special effects. We produce and present headline pyrotechnic events throughout the state of Queensland. 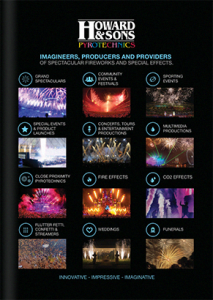 Thanks to our near one hundred years of experience in the field of pyrotechnics, where we have always kept up to date with the most recent technologies, designs, materials, rules and regulations, there is nothing we don’t know about making your pyrotechnic event dramatic, exciting, awe-inspiring, and very, very safe. Over the years we have built extremely good relationships with our logistics teams, meaning wherever you are, the Howard & Sons Pyrotechnics professional fireworks company can – and will – get there. Howard & Sons professional pyrotechnicians can bring any arena, stage, park, harbour, hilltop or even community centre to life all over Queensland, from the Whitsundays to Brisbane, and from the Gold Coast to the Mt Isa. We supply specialised teams for one-off or multiple date, indoor or outdoor pyrotechnic special effects. Whether you are working with a theatre, private or corporate event, band, movie shoot, photo shoot, circus or sporting event, we know exactly what is possible and what is safe. For the largest audiences, Howard & Sons Grand Spectaculars combine futuristic displays with centuries-old ingredients. If you are looking for experienced and ground-breaking pyrotechnicians huge-scale or wedding fireworks display in the Queensland region, please contact our Howard & Sons Pyrotechnics Brisbane number or email address. Naturally, all of our pyrotechnicians working in the Queensland region hold a fireworks operator licence. You might not need much convincing to drop us a line, having perhaps already seen Howard & Sons Pyrotechnics shows in Queensland. Our professional pyrotechnicians have invented new firing pyrotechnic special effects which are shot out from human pyro performers, fast moving motorbikes, ATV’s and kites for various EKKA shows. Howard & Sons have also been instrumental at the Brisbane Royal Show fireworks display in past, consecutive years. Whether for the small or huge scale, our head office in Sydney can design elaborate or simple but effective displays with or without multimedia, lasers, water screens, confetti cannons and any other type of explosive entertainment without leaving you in the dark. Having representatives closer by, Howard & Sons Pyrotechnics will keep you in the picture. Give us a call today and see how our Brisbane pyrotechnician team will make your event an occasion no one will ever forget.